‘There are no shortcuts to a real sense of achievement, it has to be earned’- to inculcate this spirit, young Award participants in YES Centre Navarachna International School, Vadodara (NISV) accepted the challenge to two service projects. Mr. Ashvin Patel-YES Manager shares how the two projects have enriched and enhanced experiences of young people at NISV and developed a sense of commitment, determination and perseverance among them. The threat to the environment and the importance of trees to maintain the ecological balance is a critical one today. Seven Award participants from NISV took up this moral and social responsibility by participating in the “Conmat Cosmopolitan Tree Garden Award.” The unique feature of this competition is that it encourages students to research into the different species of the trees that can grow locally, irrigation methods employed, selection of manure and other physical conditions necessary. Pawan Srivastava, Aayush Sorathia, Miit Pandoliker, Apurva Shukla, Dhiren Patel, Nihal Solanki, Vinay Patel, Nikita Bhartwal, Yoshita Laungani, Shrey Jain and Sunny Rajani participants planted saplings of Gulmohara, Neem, Amla, Mango and Sathapati on a tree plantation in the school campus. Taking complete ownership of the saplings instilled a sense of pride, responsibility and belonging to the community. To know more about this initiative, feel free to visit www.hariyaliatnisv.webs.com, the website maintained by the group. Conservation is a state of harmony between men and land. The best use of the earth and its resources for the lasting good of men can only be achieved by creating awareness about it. 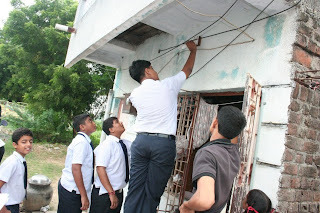 With the main objective to develop an ethos for energy conservation amongst the students and neighbouring village community, the Award participants replaced bulbs with CFLs. A compact fluorescent lamp (CFL), gives the same amount of visible light as compared to general lamps but use less power and have a longer rated life. Many CFLs are designed to replace an incandescent lamp and can fit into most existing light fixtures formerly used for general lamps, this making the transition easy. The effort put in by the Awardees through personal interaction with the villagers, preparing leaflets showing comparative study of bulbs Vs CFL, has yielded result and nearly 200 houses have been illuminated. 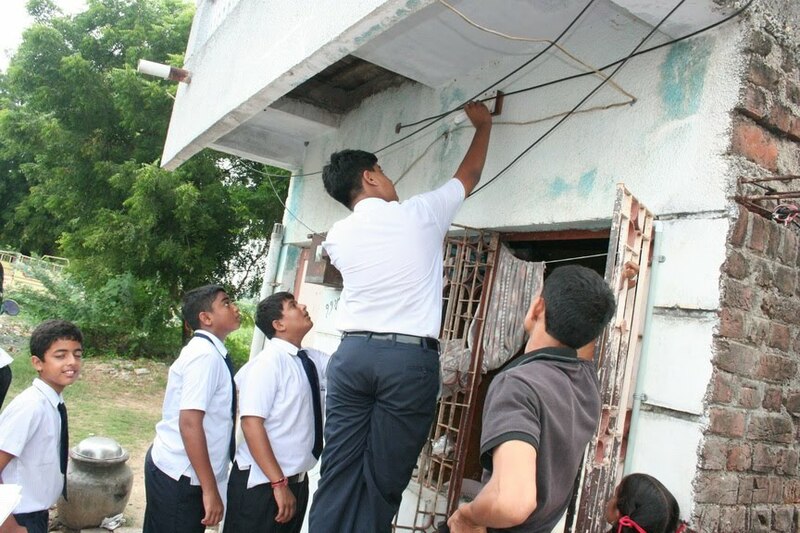 The project not only sensitized everyone to the need for energy conservation but also made them conscious to energy wastage and changed attitudes in the general daily student lifestyle. Awardees plan to create a mural or sculpture from the bulbs collected from the drive as a mark of remembrance for their initiative. Social activities provide once-in-a-lifetime opportunity to the students. Every such activity is a valuable learning experience and helps visually, to see the concerns of humanity.